Water tanks are an essential part of Australian living, especially in far-flung regions without access to municipal piped water. In these places, water comes from rain, rivers, and hired trucks. Whichever source you opt for, large, strong underground water tanks are a necessity. Under deck, rainwater tanks can help you save time, money, and make life easier. There are four main materials used to construct water tanks: steel, concrete, plastic, and fibreglass. Steel is the cheapest option, while concrete is the most labour-intensive. Each material has its pros and cons, and in the end, it comes down to personal choice. When you buy a tank or have one installed, get your purchase from a reliable dealer. Give preference to someone who will offer delivery services, a tank warranty, and after-sales service. This is important because tanks need to be inspected and cleaned periodically. Your supplier should also be available to help repair leaks and or other kinds of damage. Tanks made from fibreglass aren’t as common as other types of tanks, though they’re starting to gain popularity. They have a beautiful glossy appearance and good tensile strength so that they can handle large volumes of water. Fibreglass is resistant to chemicals, so you can treat your water without worrying about damaging the tank. Fibreglass doesn’t corrode so that the tank materials won’t wear away and you’re unlikely to deal with rust in your tank. It does have one weakness though. Fibreglass has a glossy translucent nature, so it lets in more light than other tanks. This light can encourage algae to grow, making you water unpotable. To prevent this issue, paint your fibreglass tank with opaque colours or gel coating to minimise the amount of light that gets in. Its other disadvantage is that it cracks quickly, which can cause leaks and breakage. Fibreglass tanks are sometimes lined with plastic on the inside, to reduce leakage and protect the water. Polyethylene is a popular material for tanks. It’s lightweight and food grade, so it’s a safe form of storage for drinking water. 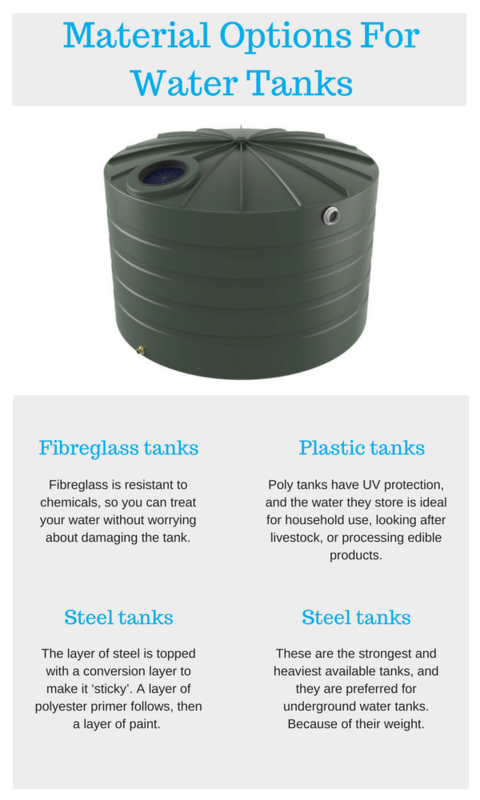 Poly tanks have UV protection, and the water they store is ideal for household use, looking after livestock, or processing edible products. Plastic tanks often have a warranty of 25 to 30 years, and they are easy to install. 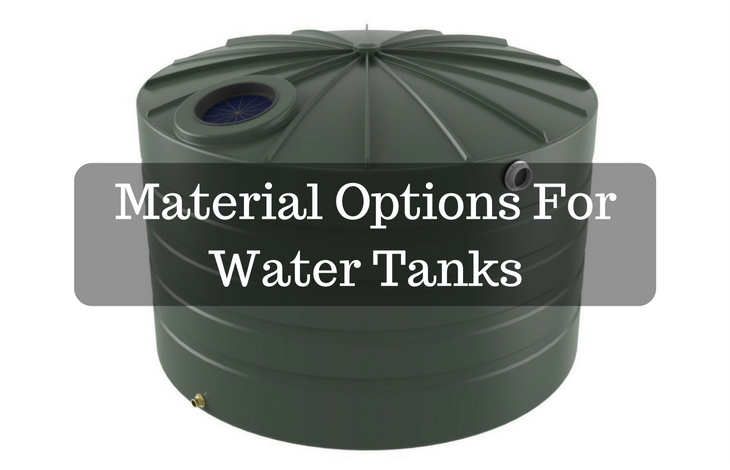 Unlike heavier tanks, plastic tanks don’t need a foundation. You can lay them on a bed of sand, though some owners prefer to install a raised platform for extra pressure and stability. Polyethylene tanks can be a style statement because they’re available in many shapes, sizes, and colours. You can coordinate your tank with your yard décor. When you’re buying a tank, check whether it has a vertical seam. Modern tanks don’t have this potential point of rupture, but older models still have that flaw in their design. While plastic tanks can withstand sunlight without melting, the heat does soften their structure, and in some cases, it can give your water a strange taste, so try positioning your tank in the shade. If you don’t have a naturally shaded space, you can lay a canopy over your tank, or build a shed. Polyethylene doesn’t biodegrade, so when you want to replace your tank, you should break the old one into smaller pieces and take it to a plastic recycling plant. Metal tanks are made of corrugated steel sheets. The main options in Australia are Zincalume or Colourbond. These materials are ordinarily used for roofing, but they work well for water storage because they’re rust resistant and waterproof. Zincalume is steel galvanised with a mixture of zinc, aluminium, and silicone. It has a glossy silver appearance and can last 10 to 15 years. Zincalume is more durable than ordinary galvanised steel, which lasts about five years before it rusts beyond use. Colourbond is zincalume on steroids. The layer of steel is topped with a conversion layer to make it ‘sticky’. A layer of polyester primer follows, then a layer of paint. These layers are baked onto the metal in turns, which makes them adhere better and last longer. Unless the paint is scratched off, exposing the raw metal to rust, a steel tank can last up to 20 years. To strengthen the tank further, a layer of polyethene may be added. It coats the raw metal, reducing chances of corrosion. These are the strongest and heaviest available tanks, and they are preferred for underground rainwater water tanks. Because of their weight, they are delivered in pieces and assembled. Other times, the concrete can be poured onsite at its intended location. They’re strong enough to be placed under a driveway, so concrete is a good option if you’re low on space. Concrete tanks are reinforced with steel, and the inside is sometimes coated with plastic. Without this polyethene lining, the concrete might leach lime into the water. This lime isn’t necessarily toxic, but it will give your water a distinctly alkaline flavour. Concrete tanks need to be inspected for cracks, leaks, or moss growth. Regular maintenance extends their life.